COLUMBUS, Ohio (AP) — An Ohio hospital said Tuesday it has put more employees, including managers, on leave amid allegations that an intensive-care doctor ordered potentially fatal doses of pain medication for dozens of patients. Mount Carmel Health System, which fired the doctor in December, said 23 staff members are on leave pending further investigation. It previously had said 20 employees — six pharmacists and 14 nurses — were on leave. 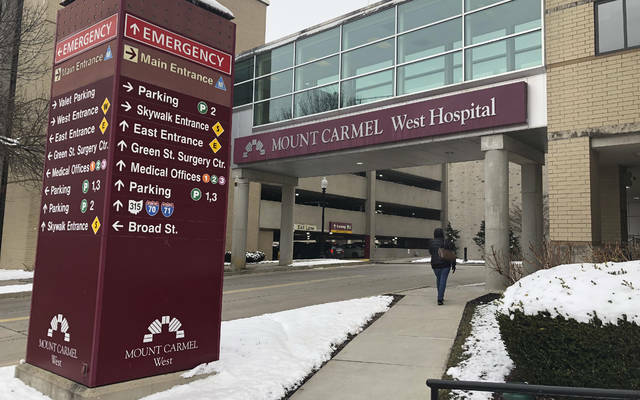 Mount Carmel found Dr. William Husel ordered potentially fatal doses for at least 28 patients over several years and doses for six more patients that were larger than necessary to provide comfort but not likely what caused their deaths. Nearly all were at Mount Carmel West hospital in Columbus. The discovery raised questions about whether drugs were wrongly used to hasten deaths intentionally or possibly illegally without the patients’ families knowing, and whether pharmacists and nurses ignored existing safeguards when approving and administering medication. Mount Carmel notified authorities and publicly apologized. It initially said affected patients were near death, but now says it’s investigating whether some received possibly lethal doses when there still might have been opportunity to improve their conditions with treatment. The State Medical Board suspended Husel’s license, but no criminal charges have been announced. Husel’s lawyers haven’t commented. At least eight wrongful-death lawsuits have been filed, alleging that patients were negligently or intentionally given overdoses and that hospital safeguards failed or were ignored. Mount Carmel said it’s reviewing records of all patients who died in the hospital and were treated by Husel, and it anticipates more affected patients might be discovered. Local authorities are investigating, as is the Ohio Department of Health. WASHINGTON (AP) — A senior Republican lawmaker said Tuesday he plans to investigate spikes in the price of insulin for people with diabetes as Congress opened hearings on the high cost of prescription drugs. Drugmaker Sanofi said in a statement that it understands that some patients are angry because they have not benefited from discounts negotiated with insurers and pharmacy benefit managers. Sanofi said it is cooperating with lawmakers. Pharmaceutical pollutants also find ways to wildlife. Fish and other aquatic wildlife remain at a high risk for biological imbalances and changes from pharmaceutical pollution. It may cause a wipe out of some species. BISMARCK, N.D. (AP) — A deadly arctic deep freeze enveloped the Midwest with record-breaking temperatures on Wednesday, triggering widespread closures of schools and businesses, and the canceling of more than 1,500 flights from Chicago’s airports. The cold even prompted the U.S. Postal Service to suspend mail delivery to a wide swath of the region.